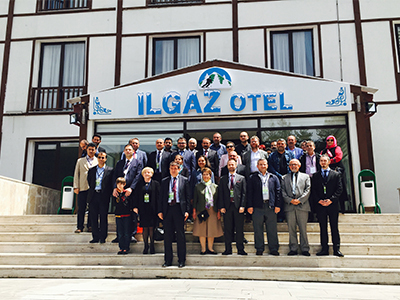 Southern Illinois University Edwardsville School of Engineering’s Serdar Celik, PhD, associate professor in the Department of Mechanical and Industrial Engineering, organized an Energy Symposium held May 12-14 in Ilgaz, Turkey focusing on energy efficiency, renewable energy and energy politics. More than 60 political leaders, academic officials and energy professionals attended the symposium set atop Mt. Ilgaz, a location which according to Celik beautifully supported the symposium’s message of clean environment and green energy. “My research field is energy, and I wanted to organize this kind of event for the past two years at the prompting of Turkish energy professionals who thought it would be beneficial,” explained Celik, a native of Turkey. “Three panels were featured during the symposium, each building off the other. According to Celik, the Energy Symposium also allowed attendees to become aware of SIUE and its comprehensive School of Engineering. Municipalities of Ilgaz and Kursunlu, Cankiri Karatekin University, and the Center for Energy, Environment and Economy (CEEE) at Ozyegin University sponsored the event. Photo: SIUE’s Serdar Celik, PhD, associate professor in the Department of Mechanical and Industrial Engineering, presents opening remarks during an Energy Symposium he organized in Turkey. Attendees gather for a group photo outside of the mountain resort hotel where the Energy Symposium was held.